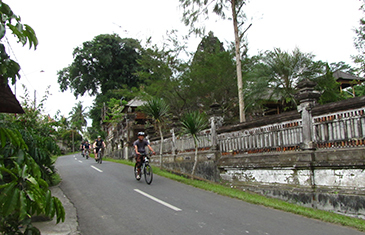 Located roughly an hour north of Denpesar, Ubud is a district situated amongst verdant paddy fields and steep cliffs. In the central heartlands, the town has been the undisputed cultural and artistic capital for centuries. Artists and craftsman alike appreciate the tranquil atmosphere and inspiring landscapes the city has to offer. Begin your adventure by trekking though Ubuds rice terraces and get a first hand look at how these hills play a central role in irrigating the crops. Enroute, we will stop at the Alas Paiguman Temple and later, visit a Balinise family. Sit down for some coffee or tea and converse with the family members to gain a deeper understanding of of how people in this region spend their days. For a relatively small island in the sprawling Indonesian archipelago, Bali is blessed with diversity at every turn. 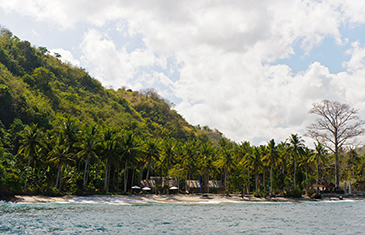 From flat, sandy white beaches, to rugged mountains, the topography of Bali is unparalled. Additionally, unlike the rest of Indonesia, most Balinese people are Hindu and their reverence to their religion is reflective in the architecture, monuments and delicious cuisine. Today, visit Lake Batur, a crater lake located north of Ubud. Travel there by car in the morning and enjoy a gentle bycicle ride along the placid shores. Afterwards, venture to the village of Trunyan, a one thousand year old settlement that has an unusual tradition of not burying their departed. Via a boat, we will make our way from the village to a forest where bodies are laid to rest under fragrant sandalwood branches –– a profoundly haunting and enigmatic experience. One of the best ways to see Bali is simply by car. Hop in a Land Rover and zephyr past bucolic villages and bottle-green paddy fields. Your drive will also take you to the base of Mount Batukaru, and unspoit location with muddy roads; perfect for the 4×4 to nash its teeth and charge forward! During this excusion, you will make frequent stops at various points of interest, such as a traditional farmhouse, tropical gardens and an ancient quarry, where stones are still cut using traditional methods passed down through generations. Alleviating povery in rural Indonesia is not easy, but the fair trade business, Threads of Life, is working to acheive that goal. Gallery manager, Ni Wayan Weti, will show you how the heirloom-quaity textiles and baskets are commissioned and made by hand, by over 1,000 women on 11 different islands across Indononesia. Threads of Life helps weavers to form independent cooporatives to maintain the skills passed down from their ancestors. After a tour, you will have a chance to create your own batik, a technique used to dye fabric using colours derived from plants. Later in the evening, head out to Amlapura’s town center to visit the busting night market an indulge in exotic culinary delights. Bali Asli is an off the beaten path restaurant and cooking school known for its traditional Balinese cuisine. The cooking classes, hosted by Executive Chef and Director, Penelope Williams, are based on “a day in the life of…”. 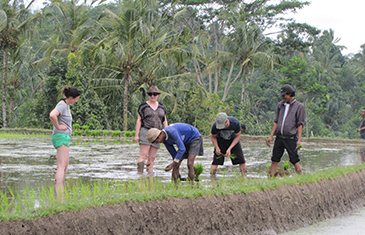 Every class focuses on the cuisine in the various regions of Bali with a different theme. The restaurant is situated at the foothills of Mount Agung and surrounded by rice fields with not another building in sight. On your way to Jimbaran, make a stop at the D’Tukad River Club, a nature & activity venue with a swing and a tree house, nestled next to the Blagsinga waterfall – one of the most well-known waterfalls in Bali. This area is fantastic spot to enjoy a drink, go on a short hike and absorb the natural beauty of the surroundings. Jimbaran is the quintessential seaside town in Bali and there you will find swathes of golden sand beaches that lead to majestic limestone cliffs. 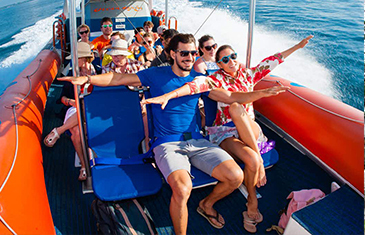 Experience the most exciting full day cruise as you discover the splendid sights of Bali’s three sister islands; Nusa Lembongan, Nusa Penida and Nua Ceningan. Cruise gently past towering limestone cliffs with dramatic facades plunging directly into the sea. Float by the “Hole in the Rock” and the “Manta Point Gate”. Lastly, experience the channel mangroves and wonderfully secluded beaches. Snorkeling, whale and dolphin spotting is abounding.